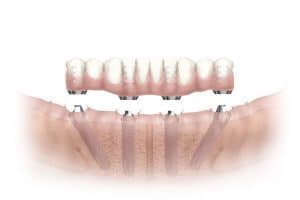 The All-on-4® treatment concept refers to the replacement of all teeth on as few as FOUR dental implants, which will support them. 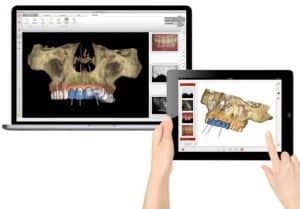 This revolutionary technique allows surgeons to gain optimal results as they provide the required support for total rehabilitation of the mouth. By tilting the back implants to a 45-degree angle, it helps overcome bone deficiencies often found on the back jaws, eliminating the need for bone grafting. ”I am really glad I chose to work with both Dr. Daniel and Dr. Abi Nader as they are truly outstanding professionals. We are very lucky to have both of them in Atlantic, Canada. This procedure has given me a new lease on life. I would highly recommend both Dr. Nach Daniel and Dr. Abi Nader to anyone. When Dr. Daniel performs the All-on-4® treatment concept, he uses the Nobel Clinician program as a tool for guidance. This program allows him to perform a blueprint of the surgery prior to the actual surgery-taking place. The program also helps Dr. Daniel find optimal placement for the implants, maximizing function and integration for patients. It also acts as an information tool to show patients how the process will take place. Dr. Daniel (Oral Surgeon) and Dr. Samer Abi Nader (Prosthodontist) have successfully performed the All-on-4® treatment concept procedure on over 450 cases together. The results have been overwhelmingly well received and they are one of the few to offer this service in Atlantic Canada. Both currently teach the All-on-4® technique at the East Coast Oral Surgery Education Center to general dentists and specialists. 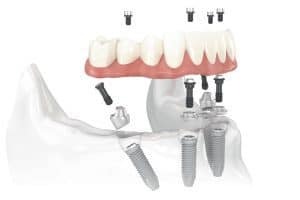 A Dental Implant replaces the tooth root and builds a stable foundation for a crown, bridge or replacement solutions for a toothless jaw. Once inserted into position, it looks, feels, and functions like a natural tooth. This small post measuring only a few millimeters long is firmly anchored and integrated into the jawbone. What are the advantages of the All-on-4® treatment concept? For more info about the All-on-4® treatment concept, please call our office today!